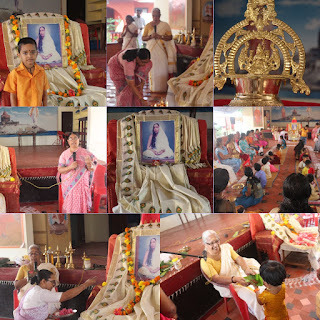 On the occasion of Sri Sarada Jayanthi, the birth anniversary of Sri Sarada Devi the Holy consort of Sri Ramakrishna, every year here in Anandadham Matrupooja is conducted for the mothers of the tiny tots of Sandeepani Sishuvihar and the neighbourhood children. This year too, the tradition was followed. 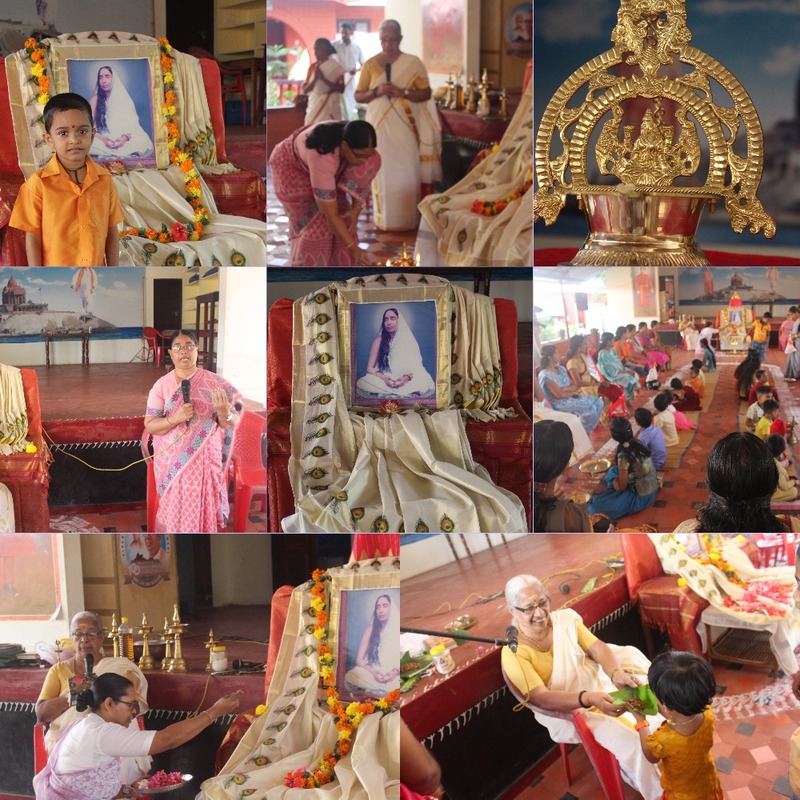 Twenty five children and their mothers and grandmothers took part in the pooja.The programme started with deepa prajwalan by the Chief Guest Smt Jayashree, a senior teacher of Amrita Vidyalayam, Kodungallur.This was followed by pushparchana and arati at the feet of Sri Sarada Ma. The tiny tots, their siblings sat at the feet of their mothers. The youngest of them was Master Abhijit who is two years old. Mananeeya Lakshmi meticulously guided the children in performing the pada-pooja of their mothers. With tiny fingers they washedthe feet of their mothers, applied sandal paste and kumkumam, offered flowers and deepa aradhana and lastly fed their mother with ladoo and got a share of the offered laddoo sitting on the lap of their mothers! It was indeed an emotional moment for both the mothers and their children. From this tender age, this samskara of worshipping their mother is being inculcated into these children so that this attitude of reverence remains till they are matured. While talking to the mothers, Smt Jayashree, narrated about her own life and how she was chosen as a teacher of Amma's school. Good samskaras always help individuals to take up the right path. Mananeeya Didi in her speech asked the mothers to meditate on their motherhood and expand themselves so that they could understand their children better. The programme ended with prasad vitaranam.